Once plain and strictly functional devices for keeping children and/or animals safely contained, garden gates are now a popular and attractive landscaping element. There are many different styles and types of gates and choosing a garden gate from the vast variety available isn't always easy. Garden gates range from simple to elaborate. They serve a variety of functions, from lawn decor to transition between outdoor areas. A good garden gate should be able to blend in with it's surroundings, a garden fence or wall and lawn and plant areas. We offer a full design, supply and installion service on all types of garden gates. 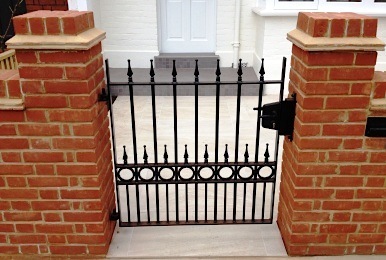 Gates come in many different shapes and sizes and can be made from different materials. There are both softwood and hardwood timber gates then there are metal gates. There are many different uses and or area’s that a gate may be required, for example. Front Gate, Side Gate, Pedestrian Gates,Driveway Gates, Entrance Gates and Field Gates to name a few. A timber gate requires maintenance such as paint or varnish, to avoid any water penetration which in turn would cause rot! There are many suitable products on the market, but the maintenance needs to be repeated on a regular basis.